there are lots of other people online who've said much more eloquent things about frazetta's life and work than i'm likely capable of right now. i can never hope to approach his skills with a brush, but i will continue to learn from them for the rest of my career. he is very much missed. Well said, Tom! And a great piece!! 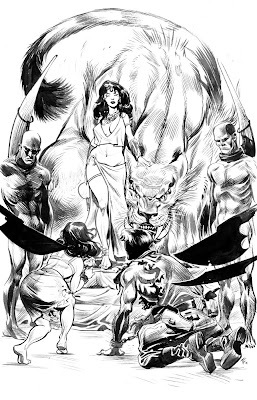 Wow, Tom, really great inks. ramon, while waiting for feedback from my current employer. it's always the last place you look. Tom, I cannot get over how much I love your inks. Stunning work!